Nature's Paradise — Costa Rica. This is a 10 x 10 inch full color, 200 page coffee-table photo book. It shows captivating examples of wildlife and scenes a traveler might have seen or hope to see in Costa Rica and in some cases other Central American countries. It can be a souvenir, a resource for travel, a wildlife reference, or simply a beautiful coffee table conversation piece. It captures the Costa Rica’s great biodiversity through stunning photographs from many different areas. It was prepared in collaboration with Costa Rican photographer Marco Saborio who was able to add a unique local perspective. The book includes many birds because they are of such great interest and so often sought after, but it also shows butterflies, reptiles, mammals, and scenes of great beauty. It is not a guide book nor is it heavy on biology; its emphasis is on beautiful photography with locations and interesting information provided about each subject. Conservationist Archie Carr III of WCS had this to say about the book in its foreword: "It must be in the artistry. 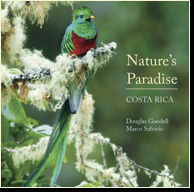 How else do you explain the freshness and luminosity of this, another book of photographic images of the wildlife and landscapes of Costa Rica? I’m convinced the book works because of the skill and soul of the two authors. They are artists, and for me, this book is like Costa Rica all over again." The book was published in April 2012 by Brio Books of Minneapolis, MN; it was printed and bound by Walsworth Book Group of Marceline, MO. Brio Books went under in September 2012 and the book has been re-published by Nature Arts Press. The cover price is $40 plus tax and shipping, if applicable. It is also available at some locations in Costa Rica and in northern New Jersey at Book Ends in Ridgewood and Wild Birds Unlimited in Paramus. Reviews, several page previews, and national sellers can be found here. Contributor to: In the Presence of Nature: Celery Farm Natural Area in Allendale, NJ, by Jim Wright and Jerry Barrack, Camino Books, 2003. Co-Authored with Jim Wright and Jerry Barrack: Jungle of the Maya, University of Texas Press, 2006. Numerous private books have been prepared documenting my work and travel.